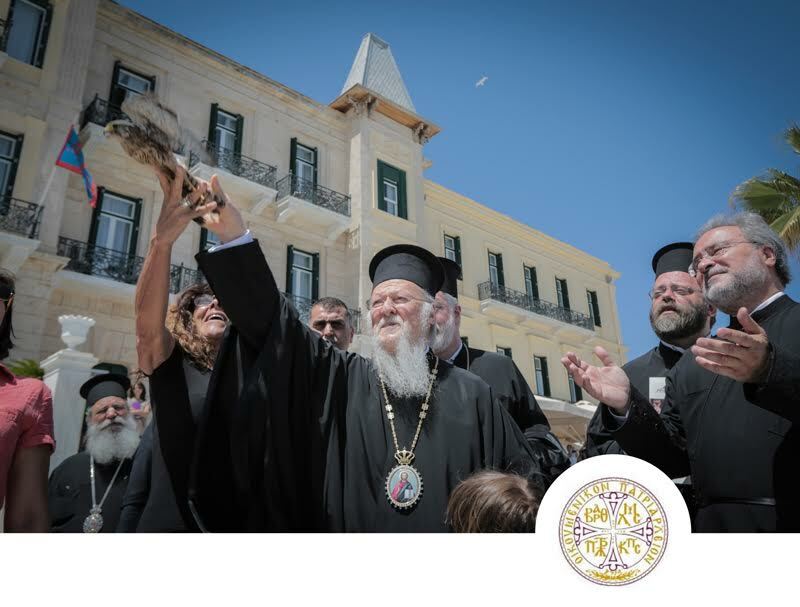 Using the words “It is better to live free!” the Ecumenical Patriarch released 2 rock kestrels rescued by ANIMA, during the second day of the International Symposium about nature protection and the protection of all those having this planet as their home. The Patriarch stated in his opening speech: “Ecologic crisis made us realize that the entire world is an undivided whole, our problems are universal and shared by everyone without exception”. He also pointed out that “Since the beginning of our engagement with ecological issues, the coherence between environmental and social problems was underlined, up to the point that these matters should be addressed in correlation to each other and with everyone’s collaboration. Preserving and protecting natural environment and respecting and serving our fellow human beings, are two sides of the same coin”. Summarizing what needs to be done, the Ecumenical Patriarch Vartholomeos brought Christians in front of their main responsibility, the one towards their neighbor which is identified with the one towards the environment and reminded us all the great journey that each one of us has to perform, from the “mind” to the “heart” and from the “heart” to “action”. At the same time he pointed out how much we could achieve if we all worked together: ordinary people, scientists, organizations, states. Causes and consequences of pollution and the solutions humanity can provide. The migratory issue and its connection with the destruction of nature. Countermeasures in the destruction of nature. The role of Economy in ecological disaster. Organizations that support protect and rescue the environment, the socially weak groups and the preservation of the ecological and social stability of the planet. The symposium took place in Spetses and Hydra, while the final conference took place on board, on the ship “Platytera”. More than 200 scientists, theologists, politicians, businessmen, academics and university students participated.